The Mews Clifton is a luxurious bridal boutique in the heart of Clifton Village. The Mews sells wedding gowns from some of the world's finest dress designers. The shop is open (by appointment) from Tuesday to Saturday, 10am - 4.30pm. You can visit the website HERE. I have fallen in love with one of the dresses: the Kelly Dress, designed by Stephanie Allin. 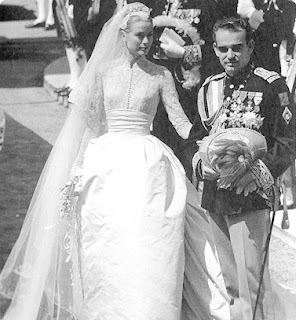 It is based on Grace Kelly's wedding gown of 1956. Each of Stepanie Allin's gowns is British-made and exclusively created by her highly skilled team. Grace Kelly's dress was designed in 1956 by Helen Rose who was then wardrobe designer at MGM. It was made as a wedding gift from MGM (Metro-Golwyn-Mayer Studios). The wedding gown was made from antique Valenciennes rose point lace, twenty-five yards of silk taffeta and ninety eight yards of tulle. Her veil was covered with appliquéd lace lovebirds and thousands of seed pearls. To see more beautiful bridal gowns on the The Mews website, click HERE. For you to have a perfect wedding dress, you must choose the best designer - someone you think can be trusted. This can give you the assurance that you will be satisfied with the kind of service being rendered to you.